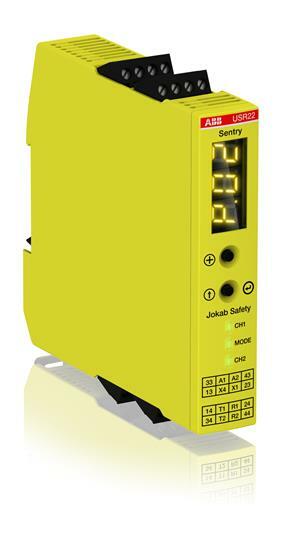 USR22 is a universal safety relay/safety timer with relay outputs, 2 NO + 2 delayable NO, and a +24VDC power supply. USR22 is used with safety devices with contacts, 1 or 2 channels , safety devices with OSSD outputs, two-hand devices, safety mats and safety edges/bumpers. USR22 offers 0-999 seconds timer functions with a better accuracy than 1%: OFF-delay, ON-delay, Time bypass and Time reset. A display on its front facilitate configuration and troubleshooting by displaying error codes and error log. A custom configuration can be protected by password. The reset function is selectable between Automatic and Manual.